This old family recipe for homemade cannoli includes homemade shells made with wine, and a simple cooked ricotta filling. 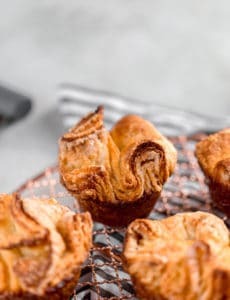 Add some mini chocolate chips or chopped nuts to the ends, a dusting of powdered sugar, and you have a tower of the most delectable Italian pastries! 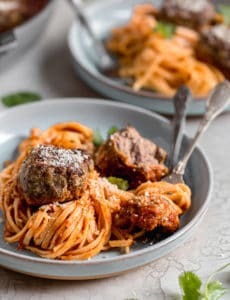 This recipe is super special to me, as it hails from my husband’s family. I had enjoyed cannoli many, many times, but it wasn’t until I started dating my husband that I found people who actually made the whole pastry (shells AND filling!) completely from scratch. Not only were the shells and filling homemade, but my husband’s grandfather used to work at an aluminum plant and crafted the cannoli forms himself! Nearly 10 years ago, on New Year’s Eve day, we all gathered at his parents’ house to make cannoli. I watched his Nana roll out the dough, watched his dad stir the filling patiently, and then got to enjoy the fruits of our labor. 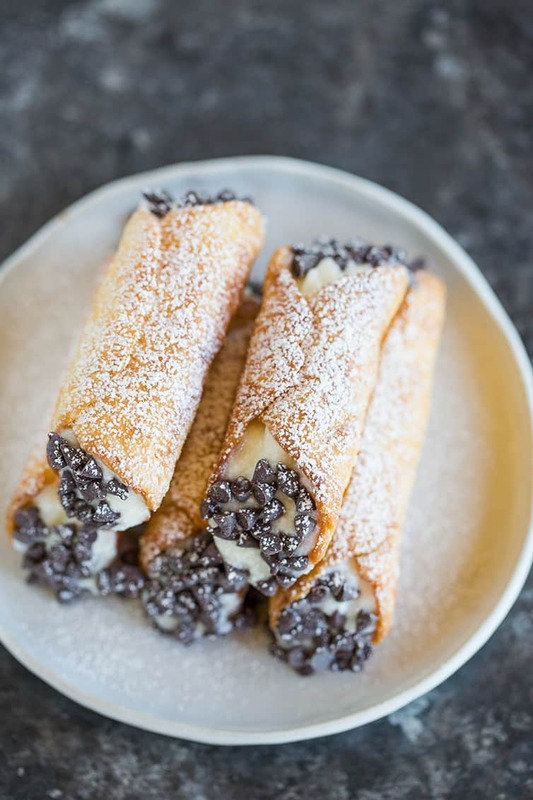 If you are not familiar, cannoli are a traditional Sicilian pastry that is made by rolling out a circle of dough and wrapping it around a metal cylinder or “form” and then deep frying. Once cool, the shells are filled with a sweetened ricotta filling. Sometimes nuts or dried fruit are added to the filling and sometimes the ends are dipped into crushed nuts or chocolate chips. Utterly delicious! How Do You Make Cannoli? 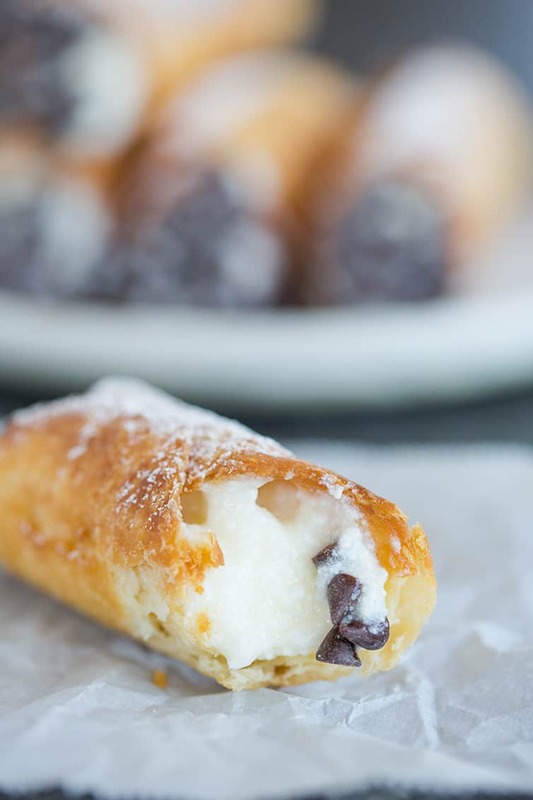 There are two components to cannoli: the shells and the filling. 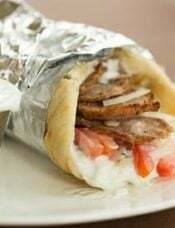 They are made separately and then the filling is piped into the shells adorned on the ends with things such as mini chocolate chips, chopped nuts, citron, etc. and the whole thing can be dusted with powdered sugar before serving. What is in a Cannoli Shell? Are They Baked or Fried? 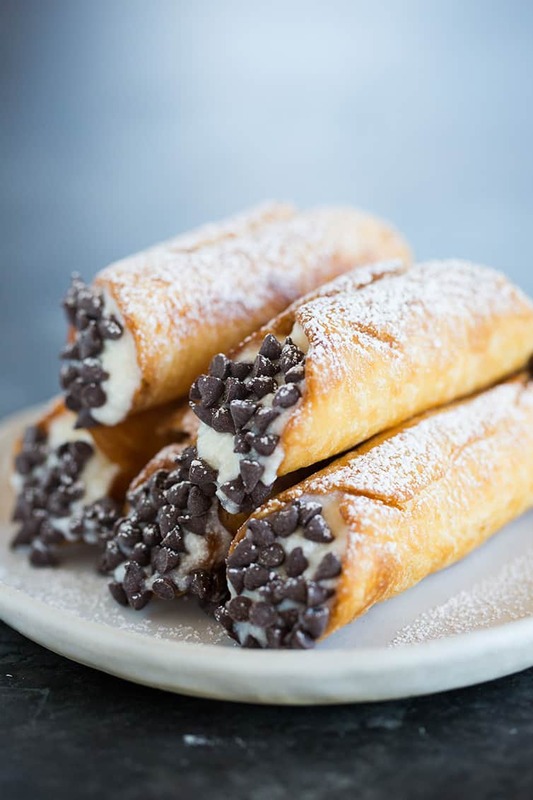 Homemade cannoli shells are made with a dough that is similar to pie crust, though slightly more stable thanks to egg yolks, which also make it easier to roll out. 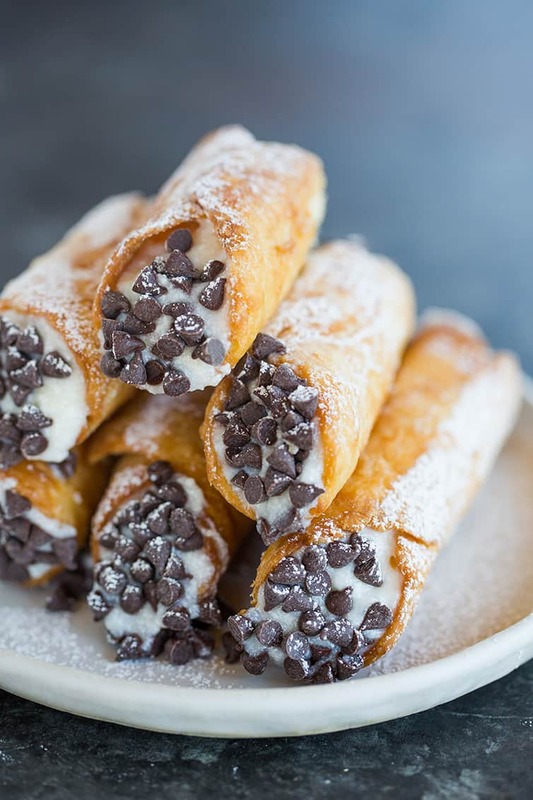 Cannoli shells also include wine, which is added for flavor, as well as for its acidity, which helps in softening the gluten and ensuring that the shells are crisp and light, and not at all tough. 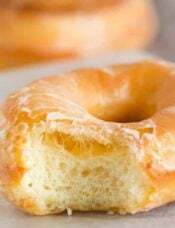 The dough should be rolled out incredibly thin; this ensures that they are flaky and light and don’t take on too much oil during the frying process. 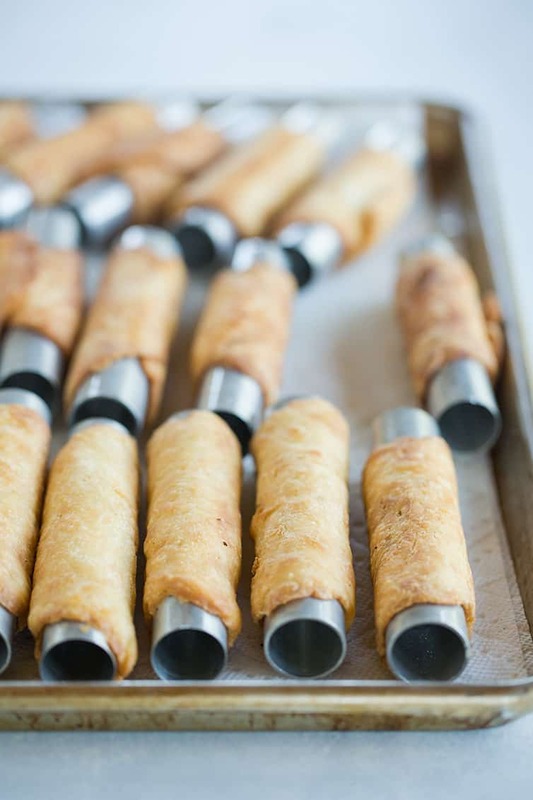 Once the dough is rolled out, it is wrapped around individual cannoli forms. 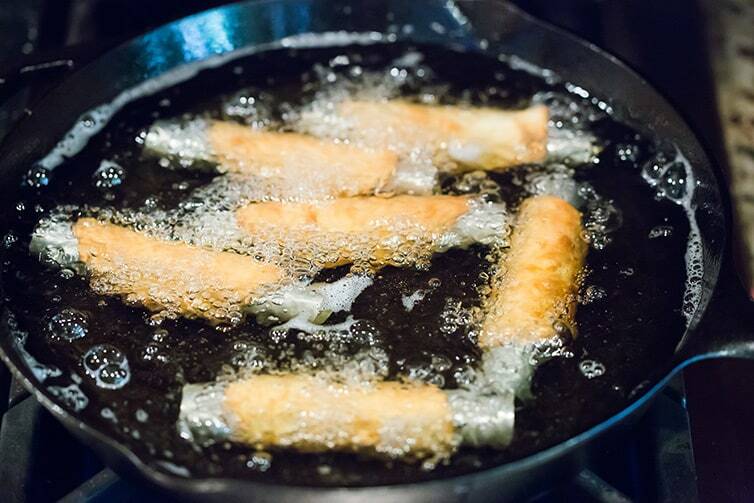 The shells are traditionally fried to create a super light and flaky consistency. If you want to bake your cannoli shells (blasphemy! ), you can do so in a 350-degree oven for about 15 minutes, or until golden brown. What is in Cannoli Filling? Traditional cannoli fillings are made with sweetened ricotta cheese. Some fillings call for draining the cheese or beating the cheese, then mixing in the sugar and other add-ins in various ways. 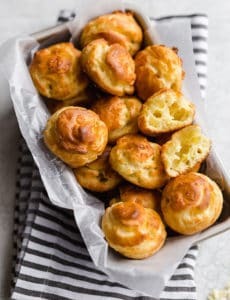 This particular recipe is for a cooked ricotta filling – the ricotta is beat with a mixer to smooth it out, and then cooked into a sweet ricotta pudding of sorts with sugar, milk and cornstarch. It’s chilled completely before being used to fill the cannoli. 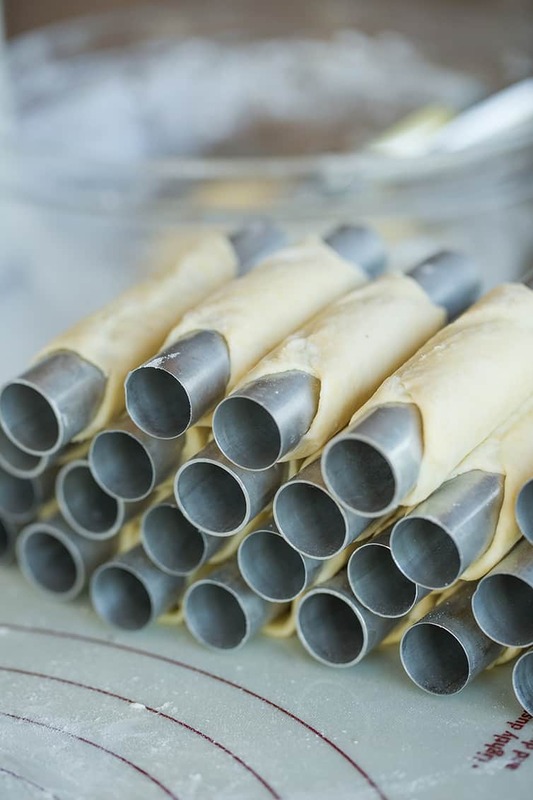 Where can I get cannoli tubes/forms? They are readily available on Amazon and most Italian grocery stores, if you have any in your neighborhood. Can cannoli shells be baked? Yes, you can bake them at 350 degrees for about 15 minutes, or until lightly browned. What kind of wine should I use in the dough? 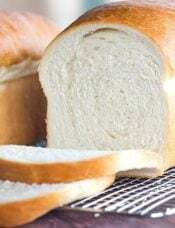 You can use red or white, although red will alter the color of the dough. Use whatever wine you have on hand; I typically use pinot grigio, sauvignon blanc, or marsala. Can I omit the wine in the dough? Only if you absolutely have to; use buttermilk as a substitute. Why is my cannoli filling runny or grainy/gritty? In each of these instances, it’s due to the ricotta cheese not being smoothed out enough. Usually beating it with a mixer before incorporating the other ingredients is enough, but if your ricotta cheese is particularly watery, you may want to drain it through cheesecloth overnight before using it. Can cannoli filling be frozen? I do not recommend it, as it has the potential to become watery once thawed. Can cannoli shells be frozen? Yes, they will freeze well. Place in an airtight container and store in the freezer. Thaw in the refrigerator or at room temperature. How should you store cannoli? Assembled cannoli should be eaten immediately, as the filling will cause the shell to get soggy. Only fill the cannoli right before serving. 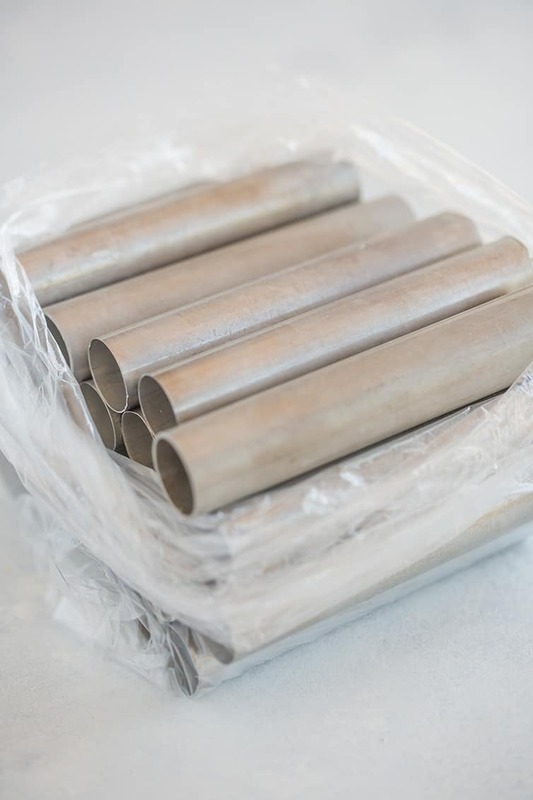 The shells can be kept at room temperature in an airtight container for up to 1 week. 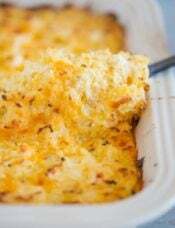 The filling should be kept in the refrigerator, in an airtight container, for up to 1 week. Need an excuse to try your hand at homemade cannoli? Mark your calendar – Cannoli Day is celebrated annually on June 16th! This old family cannoli recipe includes homemade cannoli shells made with wine and a simple cooked sweet ricotta filling. Make the Dough for the Shells: In a large bowl, whisk together the cake flour and the sugar. 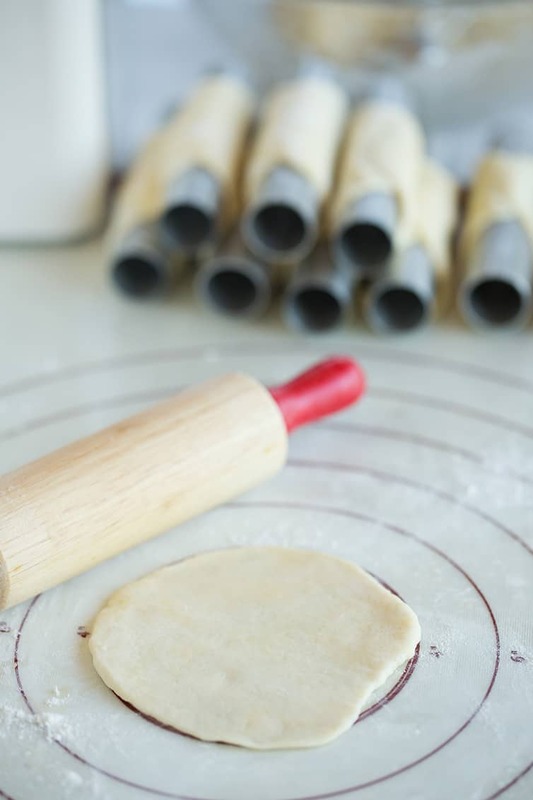 Using a pastry blender or two knives, cut the shortening into the flour mixture until it resembles coarse meal. Add the egg yolks and stir with a wooden spoon until mostly combined (the dough will look shaggy). Add 2/3 cup of the wine and stir and fold using a rubber spatula. 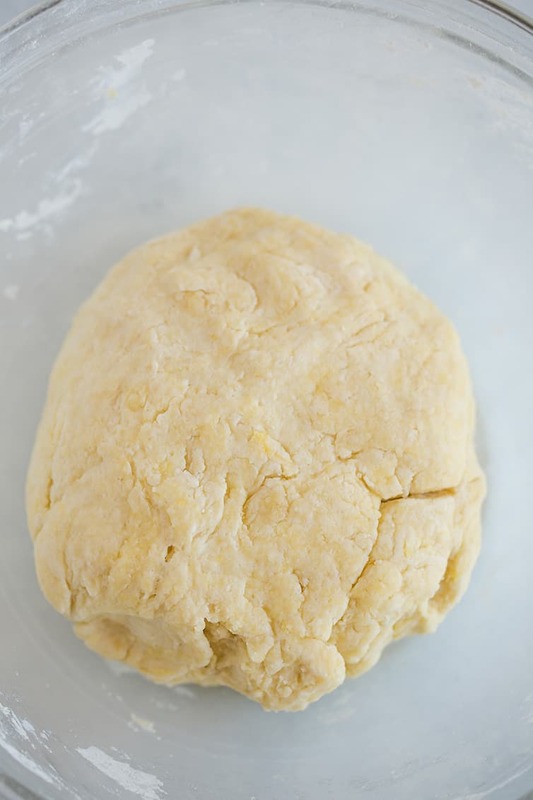 You want the dough to come together like pie dough, so if it is still dry and shaggy, add more wine, 1 tablespoon at a time, until the dough holds together when pinched between your fingers. 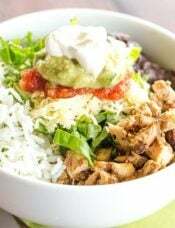 Cover the bowl with plastic wrap and allow to rest at room temperature for at least 4 hours. Make the Filling: Place the ricotta in a large mixing bowl and beat on medium speed until completely smooth, about 1 to 2 minutes; set aside. 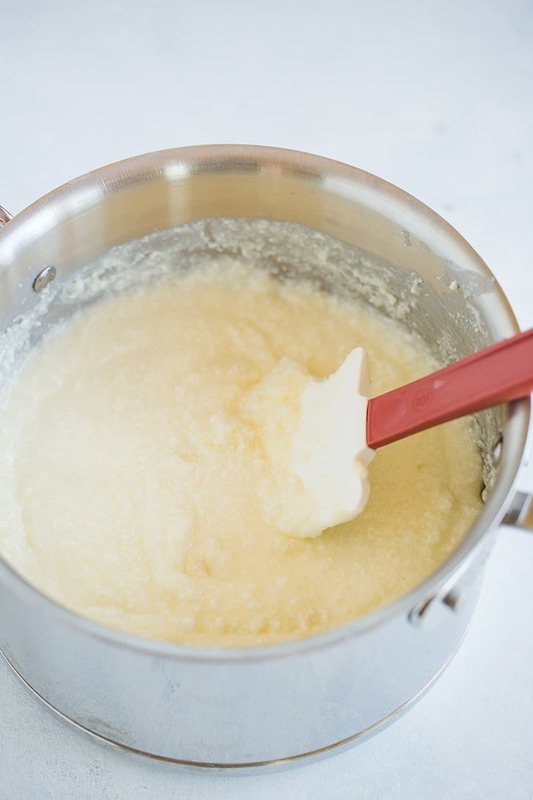 In a medium saucepan, whisk together the sugar, milk and cornstarch. Place over medium heat and cook, stirring occasionally, until the mixture is smooth and the sugar is totally dissolved. Gently stir the heated sugar mixture into the ricotta until combined. Return the entire mixture to the saucepan and continue to cook over medium-low heat, stirring constantly, until the mixture thickens (a few large bubbles should pop at the surface when it has thickened), about 20 minutes. Cool to room temperature and then refrigerate for at least 2 hours before using. The filling should be completely chilled when used to fill the cannoli shells. Make the Cannoli Shells: Using a small cookie scoop, tear off about 1 tablespoon of dough at at time. Roll to 1/8-inch thickness, about 4 to 5 inches in diameter. Wrap the dough around a cannoli form, overlapping the dough and press to seal together. Repeat with the rest of the dough. Line baking sheets with a double layer of paper towels. Add vegetable oil to whatever you are going to use for frying (a Dutch oven or deep cast iron skillet work great), ensuring you have at least 1 to 2 inches of oil. Heat the oil to 375°F and, a few at a time (or however many fit in your frying vessel without crowding), place the prepared forms into the oil. Fry until light golden brown, about 3 to 4 minutes, using tongs to move them around as necessary, especially if using a skillet, so they don't settle in one spot. Remove the forms from the oil (being careful to drain out any oil inside the form) and set the shells on paper towels to drain. Once they are cooled enough to handle, slide the shell off of the form. Assemble the Cannoli: When you are ready to serve the cannoli, fit a large piping bag with a large round or star tip, and fill it with the ricotta filling. (If you don't have piping bags and tips, you can put the filling in a large ziploc bag and simply snip off one corner.) Squeeze the bag to pipe filling into each end of the cannoli shell, making sure it is completely filled inside. Dip the ends into mini chocolate chips or chopped nuts and dust with powdered sugar, if desired. The wine is a very traditional component to the recipe for the shells and while my father-in-law states that they never omitted it; I would recommend buttermilk as a substitute if you cannot consume wine. You can use red or white wine for the dough, although red wine will darken the color of the shells. I typically use whatever I have on hand (pinot grigio, sauvignon blanc, or marsala), you can use pretty much anything! You should only fill the cannoli right before you are planning on serving them so the shells do not get soggy. You can store the empty shells in an airtight container at room temperature for up to 1 month, and the filling in an airtight container in the refrigerator for up to 1 week. Only fill as many cannoli as you plan on eating! This recipe was originally published on January 8, 2010. What exactly does 3/4-1cup mean? I’m not understanding how much wine I need for the recipe. It says 3/4-1cup. What exactly does that mean? Wow your cannoli look really great, look at all the blisters. And you made so many of them. Nice job! I cannot print your recipes !! Why not? Are you clicking the “print recipe” button above? It’s working just fine for me. 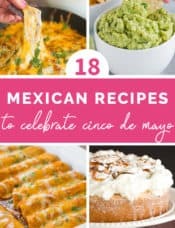 I really appreciate that you include a photo and recipe notes/tips on the printed recipes. Thank you! Your cannoli look delicious! Since I returned from Italy I’ve been meaning to make them myself but been putting it off. Seeing how easy the dough is to make I might give it a go finally!